Enlarge CAT6 multimedia tray - LSA. CAT 6 multimedia tray with LSA technology. The clamp and cutter on the rear mean that no tools are required so that it is easy to install network cables and save time while doing so. Unique colour-coding to prevent mistakes. The transition to the multimedia connection is ideally shielded from interference by an additional closing cap. 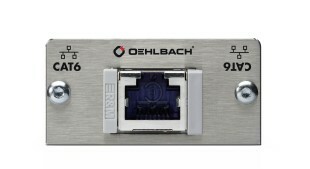 The multimedia tray possesses a standard RJ45 socket on the front for connecting conventional patch cables. The tray comes with 24-carat gold-plated contacts. In combination with the mounting frame, any two multimedia trays (alternatively one tray combined with a blind cover) may be used for each frame with the internal dimensions of 50x50 mm.